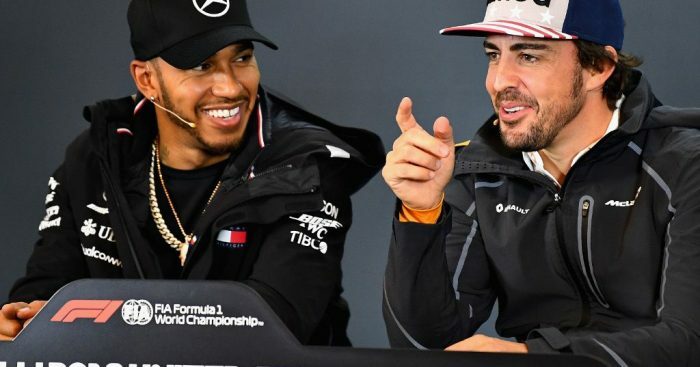 The 2018 championship is barely over but already Fernando Alonso is predicting a sixth World title for Lewis Hamilton next season. The Mercedes driver clinched his fifth World title in Mexico on Sunday as he brought his W09 across the line in fourth place to take an unassailable lead in the Drivers’ standings. With 358 points on the board, Hamilton cannot be caught by second placed Sebastian Vettel. Hamilton’s fifth means he is tied with Juan Manuel Fangio, however, the record still belongs to Michael Schumacher who won an unprecedented seven Drivers’ Championships. And while Alonso says one cannot compare Hamilton’s success to the other two, he reckons the Brit is not yet done. “It’s difficult to rank in different times, different eras of Formula 1,” said Alonso. “Some of the championships you are fighting until the last race, some of the championships you are winning against your team-mate. Arguably Lewis lost with Nico [Rosberg] one of those championships. “But he is one of the top so I think he should be happy with that. And it’s not finished yet. The Spaniard says Hamilton has been aided in his championship by having one of the best cars on the grid, something that any driver needs in order to fight at the front. “I think we all could have a run in championships like Lewis had or Sebastian had – he won four championships and he had half a second or one second advantage to the next car.